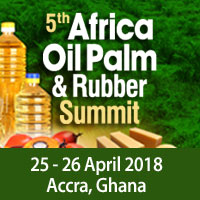 CMT’s 5th Africa Oil Palm & Rubber Summit on 25-26 April, 2018 in Accra, Ghana focuses on new investments in Africa’s palm oil and rubber markets, RSPO certifications, sustainability, traceability, responsible sourcing and advanced farming techniques. The summit provides a vital platform to learn about the latest projects as well as network with major players from the palm oil and rubber industry in Africa. As Malaysia and Indonesia – two of the largest palm oil producers, intensify their ventures in developing palm oil plantations in Africa, it is an opportune time to find business opportunities in these sectors. The summit provides a vital platform to learn about the latest projects as well as network with major players from the industry. Opening session by Mr. David Jackson, Director of Oils Research, LMC International brings to light rapid slowdown in palm oil planting in Southeast Asia which is expected to affect supplies and prices. He presents on – Are We Heading Towards Higher Palm Oil & Rubber Prices? Palm oil producer Olam, that recently received RSPO certification in Gabon, presents on ‘Integrating Africa with the Global Industry’. Palm oil end users sharing their perspective at the summit are – Flour Mills of Nigeria presenting on ‘Backward Integration and Maximizing Local Content’ highlighting oil palm demand and supply projections, investments in palm plantations as well as developing downstream processing industry. Unilever Ghana shares its Sustainability Strategies in Supply Chain with details of its traceability, sourcing and transparency aspects of sustainable palm oil. PZ Cussons Nigeria provides a vital perspective for Personal Care on ‘Sustainable Palm Oil Sourcing Policies - its Implementation Challenges’. Advances in farming techniques is another key focus with ‘New Technologies - Migrating Traditional to Precision Agriculture’ particularly use of drones and Artificial Intelligence presented by WeFly Agri. In addition, ‘New Planting Materials & Procedures, Improving Cultivation Techniques & Yields’ and the need for commercial oil palm varieties is shared by PalmElit. The program also includes a session by Sime Darby Plantation. Natural rubber markets in Africa is analysed by Socfin providing details of ‘Sustainability in Natural Rubber Supply Chain - Between Standards, Commitments & Assessments as well as share the expectations of a rubber grower’. In addition, a post conference site visit to Wilmar Refinery in Ghana is arranged on 26 April. Visit event website or contact Ms. Huiyan Fu at +65 6346 9113 for more information.